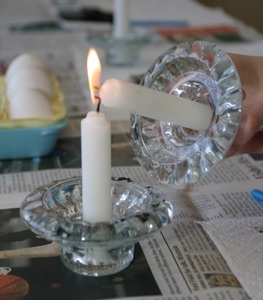 Candles are an invaluable part of pysankarstvo, used both for heating the stylus and melting the wax within it, as well as removing the wax from a finished pysanka. A lit candle is beautiful to behold, with its flickering primal flame. Mind you, many of these were started by unattended “decorative” candles, but it still pays to be careful. 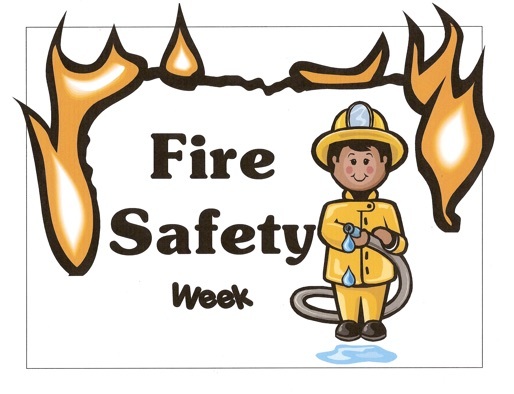 According to fire experts, the bulk of candle-fire incidents are due to inattention to basic fire safety or to the misuse of candles. A candle flame that is longer than its laminar smoke point will emit soot. Soot inhalation has known health hazards. 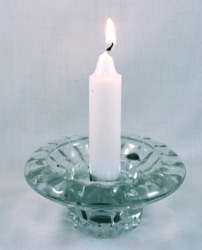 Proper wick trimming will prevent soot emissions from most candles. The liquid wax is hot and can cause skin burns, but the amount and temperature are generally rather limited and the burns are seldom serious. The best way to avoid getting burned from splashed wax is to use a candle snuffer instead of blowing on the flame. A candle snuffer is usually a small metal cup on the end of a long handle. When placed over the flame the oxygen supply is cut off. They were used daily when the candle was the main source of lighting a home, before electric lights were available. Glass candle holders are sometimes cracked by thermal shock from the candle flame, particularly when the candle burns down to the end. A former worry regarding the safety of candles was that a lead core was used in the wicks to keep them upright in container candles. Without a stiff core, the wicks of a container candle could sag and drown in the deep wax pool. Concerns rose that the lead in these wicks would vaporize during the burning process, releasing lead vapors — a known health and developmental hazard. Lead core wicks have not been common since the 1970s, although imported candles may still be found to have some lead core wicks (e.g. Chinese). Today, most metal-cored wicks use zinc or a zinc alloy, which has become the industry standard. Wicks made from specially treated paper and cotton are also available. Don't burn a candle all the way down. Extinguish the flame if it comes too close to the holder or container. Never touch a burning candle or move a votive or container candle when the wax is liquid. DO NOT move a lit candle toward an unlit one to light it; keep the lit (left) candle still, and tip the unlit one (right) towards it. Otherwise, the hot wax can spill, cause burns, and catch fire. Never extinguish candles with water. The water can cause the hot wax to splatter. Extinguish a candle if it smokes, flickers repeatedly, if it sputters wildly or the flame becomes too high. The candle isn't burning properly and the flame isn't controlled. Let the candle cool, trim the wick, then check for drafts before re-lighting. If it continues to misbehave, toss it out (or, better yet, recycle it as a fire-starter). Always be careful around candles; although they are necessary, they can also be quite dangerous.